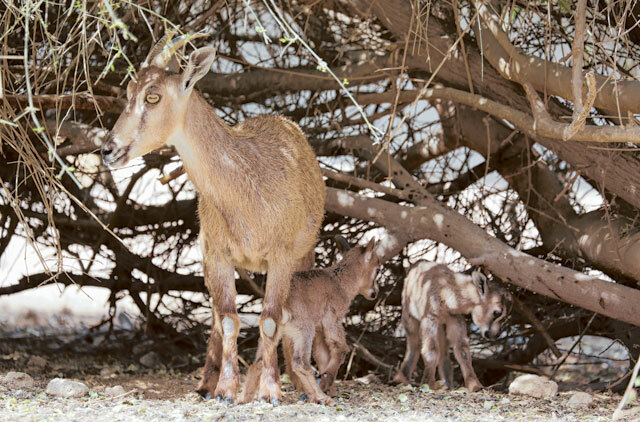 Dubai: The Management of Nature Conservation (MNC) in Al Ain welcomed its 100th Arabian tahr this season, marking another milestone in its 11-year breeding programme for the threatened species found only in Oman and the UAE. Angie, a female Arabian tahr (Arabitragus jayakari), was born early Saturday at MNC for this year’s breeding season. The centre now houses 425 Arabian tahr, believed to be the world’s biggest Arabian tahr population in captivity. It is a research and breeding facility that is not open to the public and operates under the Department of the President’s Affairs under its chairman, Dr Mubarak Sa’ad Al Ahbabi. Angie has joined 99 other tahrs born and conceived naturally since March this year, the largest live births of tahrs at the centre since 2003. “Considering the fact that the Arabian tahr is a threatened species and that MNC is the largest breeding population of Arabian tahr in the world, the fact that you could have 100 animals born in one season is a significant contribution to the increase in the population,” Willie Labuschagne, MNC’s deputy director, told Gulf News. Currently, the Arabian tahr is considered endangered in Oman and “possibly extinct” in the wild in the UAE based on the International Union for Conservation of Nature Red List of Threatened Species. It is believed the remaining UAE Arabian tahrs seen in the wild — about 10 of them — are on Jebel Hafeet. Labuschagne said the centre is expecting five more births before the season ends, making this year the most successful breeding season for the species. “This year was perhaps the best Arabian tahr breeding that we’ve ever had. We had very little mortalities. In the past, we sometimes had pneumonia cases, this year we had very few,” Labuschagne said. The centre achieved an 80 per cent breeding success rate for the 120 female tahrs that participated in the breeding season this year. Out of the 100 tahrs born, 52 are females and 48 are males, achieving a 1:1.1 ratio. An added bonus came this year when twin female Arabian tahrs, Banal and Sharrang, were born in late April, the third such case at MNC. “The twin births are extremely significant. The information we have is that the Arabian tahr doesn’t necessarily deliver twins,” Labuschagne said, adding that while the twin births happened at random, they will study the lineage of the tahrs to find a linkage between individuals that may have the characteristic to deliver twins.